Theory of planned behavior (TPB), Oral health education, Inpatient alcoholics, Structural equation model, Oral health. To be a useful source in establishing specific strategies for health education and behavioral change, it is recommendable not only to list related factors, but to systematically approach in a theoretical frame . Humans require calculated will when they do or do not act some behaviors. Behavioral theory, which does not focus on behavior itself, but on the will of behavior, is a useful model to understand practice will of dental health behavior . In the theory of planned behavior, behavior is affected by intention and perceived behavior control, intention is determined by the attitude of behavior, subjective norm and perceived behavior control, and the theory is proved to be a helpful model in predicting smoking cessation behavior, health behavior, hospital infection control, and education program development, and so on [3-5]. In Korea, the National Health Promotion Act and the Dental Health Act regulated the implementation of education business of dental health to prevent national oral diseases and improve dental health. However, the domestic ongoing dental health education has been partially carried out on schools, industry fields, disabled persons, and life cycle stages in priority , but the dental health education is restrictively implemented on hospitalized alcoholics patients or alcoholics outpatients visiting the alcohol treatment center. But the education program for hospitalized alcoholic patients has the merit that provides intensive programs during treatment period and can improve oral rehabilitation through the program [7,8]. Therefore the dental health education program should be applied variously in association with the treatment program that is provided to alcoholic patients, considering living style, diet style and dental health management behavior. Thus this study has purpose to identify the dental health-related characteristics of hospitalized alcoholics patients, figure out the effect of dental health education, investigate influencing factors on dental health behavior by applying the theory of planned behavior model, and consequently provide basic data to develop dental health promotion programs which can induce dental health behaviors more effectively. The subjects were 32 male alcoholic patients who understood the purpose of study and agreed participation in the study that allowed the study in alcohol treatment clinic in D area. The data collection and education of the subjects underwent their ethical consideration, so the approval (No. 12-05) was obtained from the Bioethics Committee of the Graduate School of Medicine of the Chungnam National University. The survey was conducted in the form of self-administered questionnaires by using the structured questionnaires after explaining the purpose of the study to the subjects, informing them of anonymity and confidentiality, and receiving the informed consent from the subjects who agreed the study, and the survey was conducted 2 times before and after the oral health education respectively. Attitude toward the behavior: the expectation of feeling that can occur as a result of behavior, and it shows the degree of 'likes' and 'dislikes' . 2) Subjective norm: influence by surrounding people who have an important meaning to one's behavior. 3) Perceived behavioral control: an individual recognition of easiness and difficultness in a specific behavioral performance. 4) Behavioral intention: intent about how voluntarily one tries to behave or how hard one tries to make an effort. 5) Oral health behavior: the final dependent variables and a series of behaviors and attitudes which maintain or promote the subject's dental health. In the study, it is the basic method to prevent dental diseases, and it is the selfreport result that the subject briefed of the number of toothbrushing periodically everyday for one week, focusing on practicable behaviors in daily life. The program for dental health education in the study was modified and complemented through the advice of two dental hygienic professors who had majored in education which was based on the dental health education contents that had been developed for adults, senior citizens and the general public by the Korean Dental Health Association . The first-week program was composed of drinking and smoking hazard, the structure and function of teeth, two major oral diseases, dental plaque and toothbrushing; the secondweek program was made up of other oral diseases such as oral cancer, cervical abrasion, xerostomia and halitosis; the thirdweek program was composed of the treatment method and materials after two major oral diseases, and denture insertion method and denture types; the fourth-week program was made up of fluoride, scaling and oral auxiliary device. The education group was trained to individual toothbrushing after the dental health education, which was implemented 4 times at one-week interval, and each time took around 40~50 min. This study found significant relations between measurable attitude on behavior, subjective norm, perceived behavior control and behavior intention and dental health behavior, which aimed at hospitalized alcoholic patients. The study composed unmeasurable attitude on behavior, subjective norm, perceived behavior control and behavior intention as latent variables, assuming that the attitude of behavior in alcoholics patients, subjective norm, perceived behavior control and behavior intention would influence dental health behavior. The observed variables of attitude toward the behavior according to models were set using scores measured from, ‘good-bad,’ ‘helpful-harmful,’ ‘boring-funny,’ ‘importantunimportant,’ ‘necessary-unnecessary,’ and ‘stupid-smart’ about toothbrushing, and the observed variables of subjective norm were set using scores measured from, ‘think I must brush teeth,’ ‘expect that I will brush teeth well,’ ‘think I have responsibility for toothbrushing,’ ‘wish I could brush teeth’ about referents. The observed variables of perceived behavior control were set using scores measured from, 'I can do it always,' 'It is an easy-difficult thing,' 'It depends on me whether to do or not to do,' 'It is me who decides on it.' regarding toothbrushing. The observed variables of behavior intention were set using scores measured from, ‘expect to do,’ ‘will try to do,’ ‘decided to do,’ ‘will do well,’ regarding toothbrushing. The causal relation model was constructed to discuss relation between latent the variables, its causal relation structure model was verified by the covariance structure analysis. In order to conduct the covariance structure analysis, the input matrix of the structural equation model was applied with the Spearman's correlation coefficient matrix by AMOS using SPSSWIN (ver. 20.0) and its parameter was estimated by the Maximum likelihood method. As the fitness of the overall model was Chi-square=170.886 (df=143) and the significance level was p=0.056, the model was suitable. GFI was 0.896, which was approximate to 0.9, indicating high fitness. The AGFI was also 0.895, which means that the model was in good condition. The lower RMR values mean the higher degree of conformity. In this study, RMR was 0.089, meaning that it has no problem in the degree of conformity. Moreover, If RMSEA was between 0.05 and 0.08, it is generally considered to be in good condition, and it showed 0.079 in this study. According to the effect of exogenous latent variables against the endogenous latent variable, which was produced through the structural equation, perceived behavior control shows that the path coefficient to behavior intention was 0.394, which has a positive direct effect in the Table 1. Table 1. Structural model of endogenous and exogenous variables in education group before oral health education. In addition, looking at the significant path coefficients between endogenous variables, behavior intention shows that the path coefficient to dental health behavior was 0.901, which has a positive direct effect. The SMC shows that in the case of behavior intention, the variance explained by attitude toward behavior, subjective norm, and perceived behavior control was 0.407, which indicates that attitude toward behavior, subjective norm, and perceived behavior control account for 40.7% on the behavior intention. In the case of dental health behavior, the variance explained by attitude toward behavior, subjective norm, and perceived behavior control was 0.603. It means dental health behavior was explained by 60.3% by the variance in the Figure 1. Figure 1: Path diagram of structural equation modeling before oral health education. The fitness of the overall model was Chi-square=147.652 (df=137) and the significance level was p=0.252, so the model was suitable. GFI was 0.925, which exceeds 0.9, indicating high fitness. The AGFI was also 0918, which said that the model was in good condition. The smaller value RMR has, the higher degree of conformity it has. It was considered a good model when RMR was approximately 0.06 or less, and in this study, RMR was 0.031, which doesn’t indicate any problems with the degree of conformity. Also, If RMSEA was 0.05 to 0.08 or less, it was generally considered to be in good condition, indicating 0.050 in this study. According to the effect of exogenous latent variables on the endogenous latent variable, which was found through the structural equation, perceived behavior control shows that the path coefficient to behavior intention was 1.307, which has a positive direct effect. And the path coefficient to dental health behavior was 0.986, which has a positive direct effect in the Table 2. Table 2. Structural model of endogenous and exogenous variables in education group after oral health education. 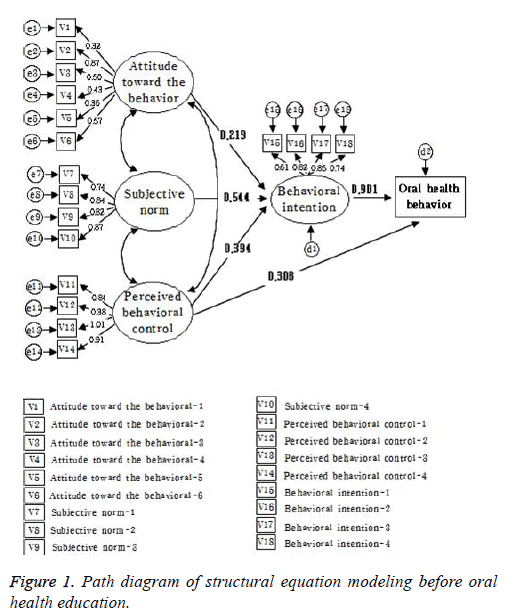 The SMC shows that in the case of behavior intention, the variance explained by attitude toward behavior, subjective norm, and perceived behavior control was 0.854. That indicates attitude toward behavior, subjective norm, and perceived behavior control account for 85.4% of the behavior intention. In the case of dental health behavior, the variance explained by attitude toward behavior, subjective norm, and perceived behavior control was 0.966. It means dental health behavior was explained by 96.6% by the variance in the Figure 2. 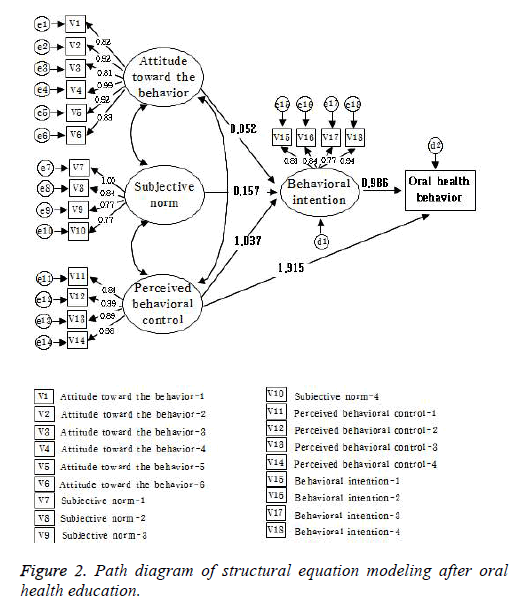 Figure 2: Path diagram of structural equation modeling after oral health education. The causal relation between behavior intentions on dental health behavior and perceived behavioral control influencing on dental health behavior, and perceived behavioral control directly influencing on dental health education was estimated. The stronger causal relation was observed after having dental health education. According to analysis of covariance structure, attitudes toward behaviors, subjective norms, and perceived behavior control explained behavior intentions by 40.7% before the education, and 85.4% after the education. And behavior intentions, attitudes toward behaviors, subjective norms, and perceived behavior control indicated dental health behavior by 60.3% before the education, and 96.6% after the education. It was thought that the stronger causal relation was shown after dental health education. Choi evaluated the factors that had an effect on the dental health behavior of students in Dental Hygienic by applying the planned behavior theory. The attitude toward behaviors and the subjective norm had a positive effect on the intent to act influencing on the dental health behavior . Han reported that, by applying the planned behavioral theory to the children from low-income families, only intention had an effect on the dental health behavior in the effects in the dental hygiene improvement program , and Nam reported in the study of breast-feeding behavior prediction that only intention had an influence on the behavior . In this study, the behavior intention in the education group before the dental health education, and the behavior intention and perceived behavior control after education appeared as significant variables, which had an influence on dental health behavior, showing a little bit different result from the studies above. The dental health behavior means a regular toothbrushing more than 3 times a day [13-15]. Therefore if behavior is not put into habit, it can be promoted by behavior intention and perceived behavior control every time. Thus, when developing the dental health education arbitration program, it will be effective to develop the program by focusing the theme on behavior intention and perceived behavior control. This study implemented 4-times oral health education programs for 4 weeks, and measured their effects immediately after the education, so their short-term effects were found, but faced a limit that patients’ condition after the completion of programs and frequent discharges from hospital made it impossible to observe subjects’ practices and regression phenomenon. Therefore, a systematic dental health education program should be developed in order to measure long-term effects, such as 3 months, 6 months, etc. [16-18]. Marcus B, Bock B, Pinto B. Initiation and Maintenance of Exercise Behavior: Handbook of Health Behavior Research. Plenum Publishing 1997. Ajzen I. Attitude, personality and behavior. Open University Press 2005. Jin HM. Factors Associated with Smoking Cessation Behavior of the University Student Smokers. J Kor Soc Aerob Exer 2001; 5: 123-132. Orbell S, Hagger M, Brown V, Tidy J. Comparing two theories of health behavior: a prospective study of noncompletion of treatment following cervical cancer screening. Health Psychol 2006; 25: 604-615. Park JH. Development of an Accident Prevention Education Program on an application of the Theory of Planned Behavior during Exercise (Focusing on Students Majoring in Dental Technicians) J Kor Acad Dent Tech 2011; 33: 65-77. Back DI, Kim YS, Shin MM. Study on the development of dental health educational materials. The Ministry of Health-Welfare 2001, 110-115. Jeong WC. A Study on Effectiveness Recognition of Therapeutic Program for Inpatient Alcoholics. Kor Acad Mental Health Soc Work 2003; 15: 32-51. Jansson L. Association between alcohol consumption and dental health. J Clin Periodontol 2008; 35: 379-384. Shin SC. Development of the object for oral health education in Korea, The Ministry of Health-Welfare 2002. Choi EJ. Influencing Factors of Oral Health Behavior in Dental Hygiene Students Using by the Theory of Planned Behavior. Wonkwoang University, Doctor’s Thesis, 2012. Kim HS, Nam ES. Prediction of Breastfeeding Intentions and Behaviors: An Application of the Theory of Planned Behavior. J Kor Acad Nurs 1997; 27: 796-806. Jeon HJ, Song KB, Lee SK. The Improvement of Knowledge and Management Capabili.T of or. HeaIth according to the OraI HeaIth Education System for Elementary School Students. J Kor Soc School Health 1999; 12: 295-303. Chambers DW. Patients susceptibility limits to the effectiveness of preventive oral health education. J Am Dent Assoc 1997; 95: 1159-1163. Choi HS, Hwang SH, Ahn SY, Sim SH. Oral health knowledge, attitude, behavior in middle and high school students and needs for oral health education. J Kor Soc Dent Hyg 2011; 11: 533-546. Lee BH, Ko DS, Bae SY, Noh JS, Choi MS, Park J. Factors Associated with Physical Activity among Female College Students: Using TPB. Kor J Health Edu Promo 2010; 27: 23.